A well seasoned steak, eggs, dark chocolate, and apples can really hit the spot. But sometimes, we could really go for Chili Pie, Benedict Deviled Eggs, Thin Mint Cookies, and Apple Pie. Even the most disciplined and willful among us can become bored and wayward on a routine of bland, repetitive meals. Humans naturally crave delicious food, interesting cuisine and variety. 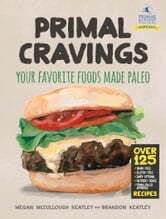 Primal Cravings sets out to provide the best of both worlds – the food to satiate our deep seated, visceral urges made with ingredients that satisfy our ancient, genetic needs for good health. This cookbook contains 125 Primal/Paleo recipes, and also includes bonus features that detail the authors’ thoughts of the tenets of a Primal/Paleo diet and the mentality of a flexible, healthy eating lifestyle to show you how vibrant health can be found without sacrificing great taste. Based in South Carolina, authors Brandon and Megan Keatley created Primal Cravings on the momentum of their popular Health-Bent.com website – a treasure trove of Primal/Paleo recipes, workout tips and motivational messages. These kitchen whizzes and expert-level fitness coaches present Primal**Cravings after several years of research, experimentation and perfecting recipes in their home kitchen. Primal Cravings presents the recipes in a simple, clear, easy-to-navigate format, and offers a detailed macronutrient analysis of each preparation. Knowing time is the most valuable resource, they also provide primers on ingredients, tools, and stocking your kitchen, and offer menu suggestions for a variety of occasions and considerations (quick, budget, feeding a crowd). With Primal**Cravings, you can enjoy assorted breakfasts, meat and main dishes, sides and salads, snacks, sweets and basics like bread, sauces, and dressings that adhere to Primal/Paleo guidelines. Inside you’ll find 100% low-sugar, grain-free, gluten-free, industrial oil-free recipes all accompanied by full color photos. Pioneering new gluten/grain free baking techniques for Primal Cravings, the Keatleys show you how to make the best Primal treats you’ve ever had. If you’ve been missing or looking for healthy, innovative ways to make things from All-American fare like breakfast egg dishes, waffles and pancakes, muffins, burgers, chili, pizza, chips, baked goods (cakes, pies, cookies, crackers, brownies) and frozen desserts to global cuisine like gyros, spanakopita, moo shu, barbacoa, tacos, tikka masala and other favorites – then this is the book for you.